Advertising may be nearer the core of Microsoft’s future plans but that doesn’t mean they’re shying away from other software and entertainment endeavors. Television and PC convergence has been a focus in Redmond for more than a decade. Many signs suggest that attention not only remains, but is growing. Looking beyond the obvious Xbox 360 and Xbox Live related activities, a quietly executed recent reorganization, seems another hint. According to a recent article from CNET’s news.com, in October, Microsoft rolled several television focus areas in to a single group. Named the Connected TV group, the newly formed organization houses HD DVD efforts, Media Center software and Internet Protocol TV (IPTV) efforts. Under the larger umbrella of the Entertainment and Devices division, the group is led by the IPTV Group’s previous directors. Combining groups theoretically increases efficiency and collaboration. The timing suggests there is a high probability Microsoft will unveil product or make announcements relating to the group at the Consumer Electronics show this January in Las Vegas. Sometimes in the public eye, and sometimes quietly, Television related platforms have been an area where Microsoft has invested heavily. First, there was WebTV (acquired in 1997). That was followed by Ultimate TV. When those consumer-centric offerings failed to hit their mark, the company refocused. Next came a push toward set top boxes and related software. In the late 90’s, Microsoft invested billions with Comcast and AT&T. ($5b was invested in AT&T in 1999, alone). Bill Gates later acknowledged they were off in their timing with those deals. In a speech in October 2004 he said frankly, "[Microsoft] got involved in TV-related software way too early, and we spent $500 (million) or $600 million before its time." Now the timing may be better. Over the past couple years, Microsoft has steadily moved toward a new (and better timed) TV platform. 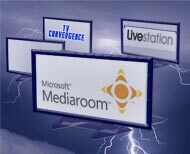 Headlining the effort, in June, Microsoft re-branded their IPTV software as the Microsoft Media Room. Sold only to broadband providers, the software package provides support for on-demand live video, video recording, time shifting, programming guides and other features. The customer list for Media Room is still small. AT&T’s U-verse service is using Media Room in the U.S., Duetsche Telekom is a partner in Germany and BT in the UK. A handful of other companies are signed up or testing it around the globe. As an IPTV platform, Media Room is streamed fully in internet protocol. Currently, there isn’t an Xbox tie in, but it is expected to have more integration with the Xbox 360 within the next few months (though availability will likely be limited to those whose service providers use Media Room). Among other headlining TV efforts from Microsoft, LiveStation, their streaming Internet TV service gets top billing as well. Originally developed in Microsoft’s UK Labs, the service has been built in partnership with London based software developer Skinkers. (Skinker’s owns the trademarks for LiveStation). Currently in a limited Beta, LiveStation is a platform for streaming video content over peer to peer networks. It’s like Joost and similar web video offerings but with a notable exception: LiveStation has the ability to stream live, and not just prerecorded, content. The service is built around Microsoft’s Silverlight client application. Both LiveStation and MediaRoom share a common ground in TV and Internet convergence, they differ in that they approach it from different ends. LiveStation is aimed to bring a more interactive TV experience to the PC. Media Room looks to bring more interactivity and Internet-like experience to the TV. Another small window into Microsoft’s TV ambitions was opened in June. Then, Microsoft bought approximately 1% of Chinese TV and appliance maker Sichuan Chanhong Electric Co. The deal was tiny in dollar value and barely noticed, but through it, Microsoft arguably bought itself a small sandbox for experimenting further with TV integration. Over a decade, with starts and restarts, forks and changes fo direction, Microsoft’s TV efforts have followed a long and winding road. They’ve made plenty of mistakes not the least of which has been bad timing. But two things Microsoft has are software development skills and deep pockets. With enough of both, they can afford to be early, or wrong, more than once. More news on Microsoft’s TV efforts is likely in the first half of 2008. With Bill Gates giving the opening Keynote address at the Consumer Electronics Show, something could be just a couple weeks away.